This weekend I ran mostly by sorc again, since I have decided to go back to Pk Dualist and I’m not interested in doing something else with my Warlock (for now) or start a new toon. I have enough toons already. So since I had ER’d it a while back I was now at level 20 and have started the climb towards 30, for a swift turn around to Iconic Deep Gnome. I am ambivalent on this; as a sorc goes he’s pretty darn good and I hate to lose that type of DPS, but I also like to play around with a wiz for a bit – if I ever make him a sorc again, 1 or 2 more Wiz will do him good. But this isn’t really a discussion about this weeks questing that took me from level 22 something to level 26 – doing all of the ES 1-3, Harper and eventually E3BC and now past the first Shadowfell and onward to the second quest line and 2 Saga completions. No this is more about the tools. From the initial 20, change at 22, some more at 24 and now 26. Some of it is named of course but more importantly – how prominent the use of the new Cannith Crafted stuff have been. 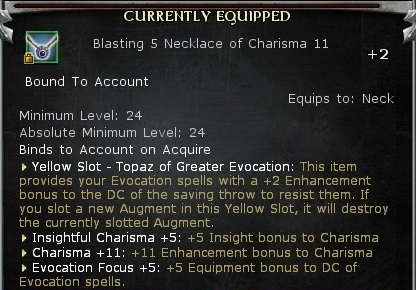 In the past I’ve used a mix of Chronosphere set bonuses (the robe and 3 other times) since it adds benefits to Evocation. 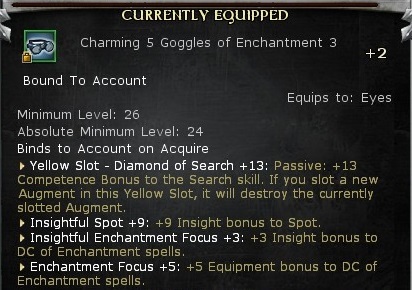 I have a complete set like this on my Paladin, and an almost full set for my Wiz. Most importantly the robe, but also the cloak, boots, bracers and helmet. I’m only missing another seal for the gloves, altho I really don’t need the full set per say. 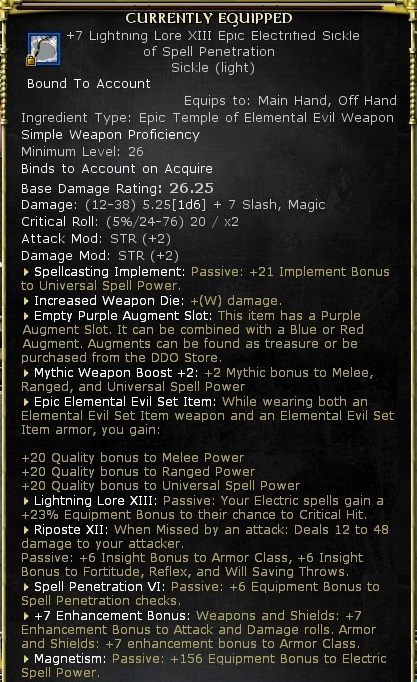 Not that Con isn’t good to have or the epic conjuration, but there are a few better items I can consider using instead, especially now when you can make your own ‘stuff’. My initial setup was the helmet from a Web of Chaos, the sage necklace, con op GS goggles, a crafted belt with constitution, false life and insightful constitution (level 20), the Chrono set pieces mentioned above (minus the helmet since I was going for 3 set, not 5 set), 2 crafted rings to add some lore and sheltering and the Hunter’s Spyglass. I had a stick that gave me magnetism with insightful magnetism and the Wizards Ward (orb) with Impulse. That adds some spell pen, +2 focus Mastery and spell power. At 20 it’s a little weak, but I figured I’d save some mats by using most of what I have named wise, and then craft a few pieces to go with it. This worked okay; I don’t run EE since I don’t want to waste resources, and it’ll work just fine on EH, even a few levels under quest ML. I did consider doing something for level 22, but I decided to wait a few more levels since there was no pressing need to exchange a big part of the setup for something marginally better. So at 24 I created several new items – including sticks, necklace, rings, gloves and belt. 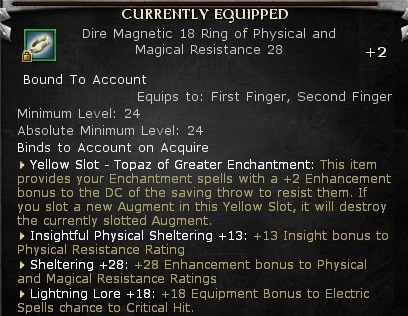 For rings I updated the lore and sheltering – to similar of what I had at level 20. That allowed me to drop the orb and go for 2 updated sticks. Impulse of insightful impulse and another magnetism of insightful magnetism. For necklace I went Evocation of Charisma with insightful Charisma. This allowed me to first remove the 10th anniversary gloves I was using at 20 (with +4 insightful Charisma) and then replace those gloves with better ones. 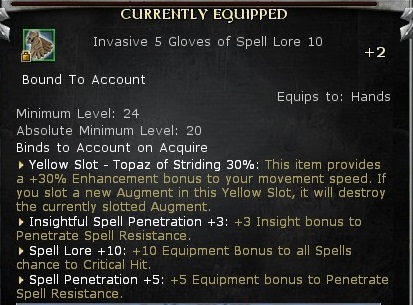 Spell Pen of Spell lore with insightful spell pen. 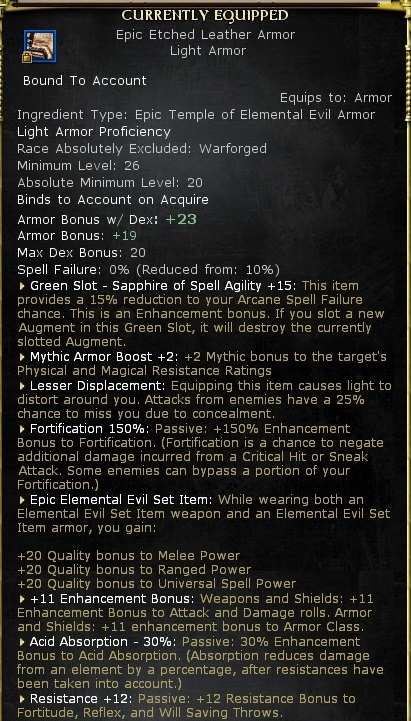 Which is a clear upgrade from the +2 spell pen from the orb. 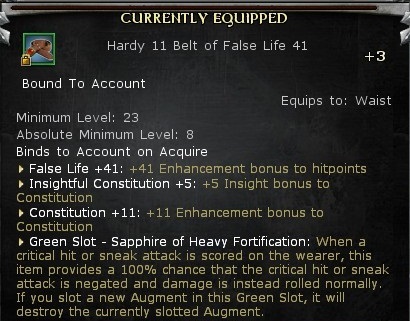 I updated the belt but as ML 23 instead, since the Constitution and the insightful constitution ticket up at 23 with only a minor adjustment in false life at ML 24. I rather be able to put on something better one level lower than get an marginal few more HP at level 24. Not that you save any resources btw – power is set by the ML shard – whether it’s ML 1 or ML 34, the cost of the constitution shard is the same. 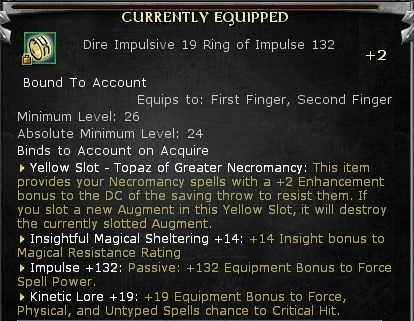 Once I hit 26 I’m now able to use some of the better named items and therefor rely less on crafted items. Such as the ToEE set of armor and stick. 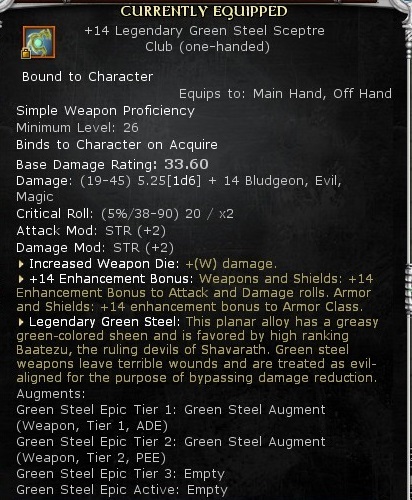 It’s also possible to equip Legendary GS and even thunderforged (tier 2). There’s both good and bad here. First, if you want the best focus possible you can easily use thunderforged. If you don’t mind slightly lower, you can always use crafted items (5 vs 6). The ToEE stick adds both lore, spell lore and spell pen, but it together with the armor also adds 20 Universal Spell Power. Not entirely insignificant. Plus a little bit more Spell power over all (Thunderforged is 150, ToEE 156). Add to that a Legendary GS stick. It’s not tier 3 yet, but even at tier 2, it has 150 stacking Spell power and +7 insightful Charisma. Add tier 3 and you also have the tier 3 bonus effect. 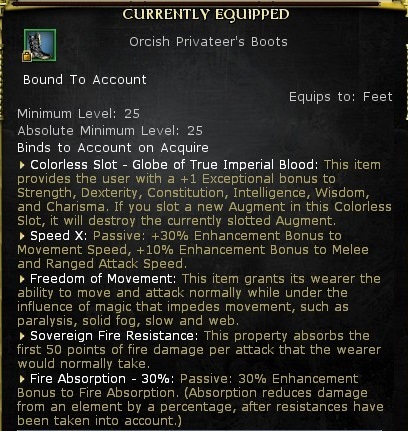 I’m not entirely sure what I want to do here, but I will probably wait until I IR before I add a tier 3 – because what’s good for a sorc isn’t always suitable for a Wiz. I also redid my enhancements trees by dropping some race traits and harper and concentrate more into Eldritch Knight. Partly to be able to use light armor, but also a few more things that adds force spell power and some shield stuff. This is the LGS stick. It current add electric spell power and positive +7 insightful. I will most likely change that to either a con op item or something else that provides +7 int. This works great in conjunction with a good ToEE armor. In this case light to add some PRR and MRR. 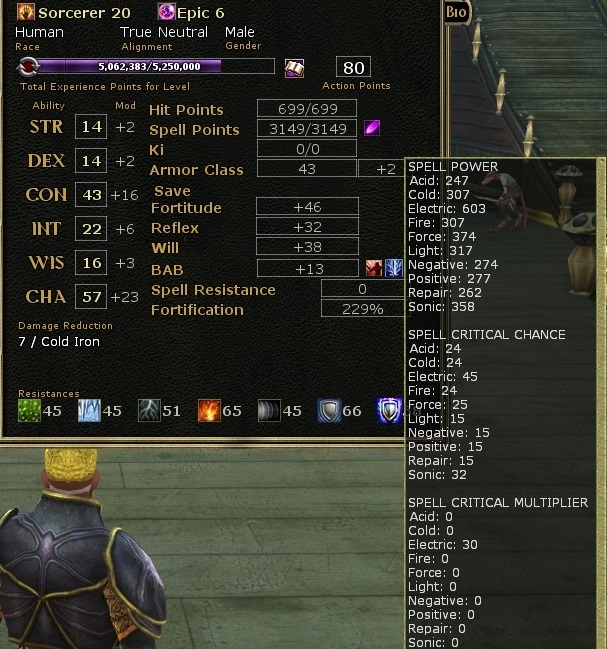 It also adds spell pen which replaces some of the effects on the gloves (see below). The search and spot is a little bit of a waste. In reality I should have added something more useful, but there was also a matter of mats. I have plenty of mats for spot, but not for some other things. This is useful both for any of my casters. Either for disco ball, hold monster or anything that require enchantment. It’s less useful for something like my Warlock but definitely for a future wiz. There are a few armor in the 25-29 range – but none that fits as nicely as this ML 26 armor. The stacking effect with a ToEE stick is nice as well. 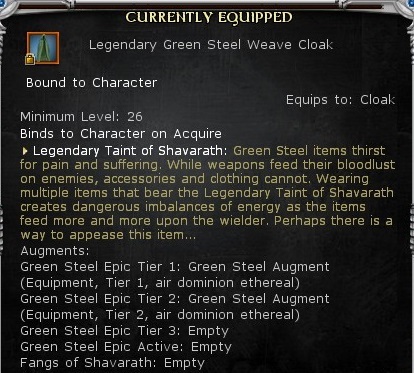 I have these in both cloak and bracer form and at almost all different level versions. It’s nice to have stacking type of effects – both for heal amp but also MRR. Altho you can very easily craft that, just not this powerful (at that level). This as you can see is an updated version – since I had an impulse stick at 24 that I now have replaced with named items, I needed an okay source of impulse (which is highly recommended to get the most out of shiradi casting). 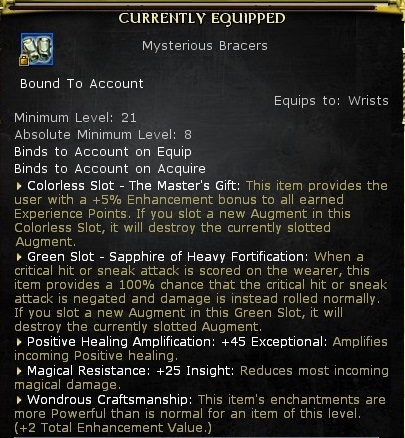 As you can see at 26 the crafted version of MRR is still inferior to the Mystical named items. And also impulse compared to thunderforged or ToEE. I like these boots. They have aged okay; maybe not for the melee and ranged alacrity, but definitely for the FoM and absorb. Sure, there are always other boot options such as (perhaps) LGS, but this one cover 2 good things to have (absorb and FoM) and that’s good enough for me. These are the gloves I created for ML 24. There’s almost no point to update it to maybe get one more percentage point out of something. Spell pen is now covered by the ToEE stick and this adds a little bit more stacking. I didn’t replace this right since again it boils down to miniscule differences and a waste of resources. Altho it’s less useful given that the ToEE stick have the same amount of Lore. But as sheltering goes it does the job. Another item I don’t need to update yet. It adds a significant amount of HP for a ML 23 item and it’s such a waste of resources to update for a slight bump in a stat. This cloak adds electric crit multiplier. It’s not tier 3 yet, but right now it adds 30 percent more. Not as useful for a wiz, so there’s always possible that I might look around for something crafted or named. Possible a Int based crafted cloak. I finally gave up the spyglass for a more updated trinket. In this case since I redid my enhancement trees, I also added a bunch of empower SP reduction. This brings it up to 8 out of 15 so basically slight more than half. 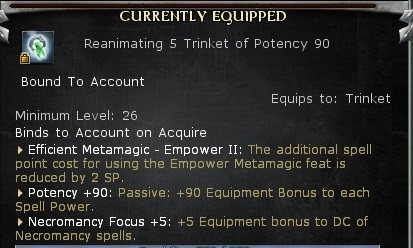 So for 7 SP more I can now empower regular spells. Again, I might just save those enhancement points for something else, but for now things are a little cheaper and a little bit more powerful. The potency helps to boost a lot of the spell powers I’m currently not covering. This is especially useful in combination with the spell lore for those Shiradi procs. And to top it off a little bit better Necromancy. Maybe Evocation, Necromancy and Enchantment to most important focuses. I didn’t update the necklace, eventho I could easily create a similar and skip the expensive insightful charisma (due to having +7 on the LGS stick). But I figured I’d wait a little and save the mats. And finally – the helmet I created for level 22. 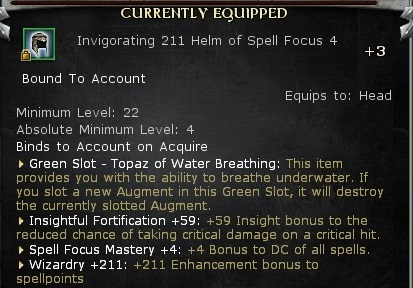 Since the most important part – spell focus mastery – didn’t go up at 26 (not until 30) I figured the slight increase in insightful fort and wizardry wasn’t worth the expenditure. All in all I’m okay with the stats. It could be better, but it works for what I’m trying to do and to get to 30 so I can turn around and IR. This entry was posted in Uncategorized on October 3, 2016 by patang01.